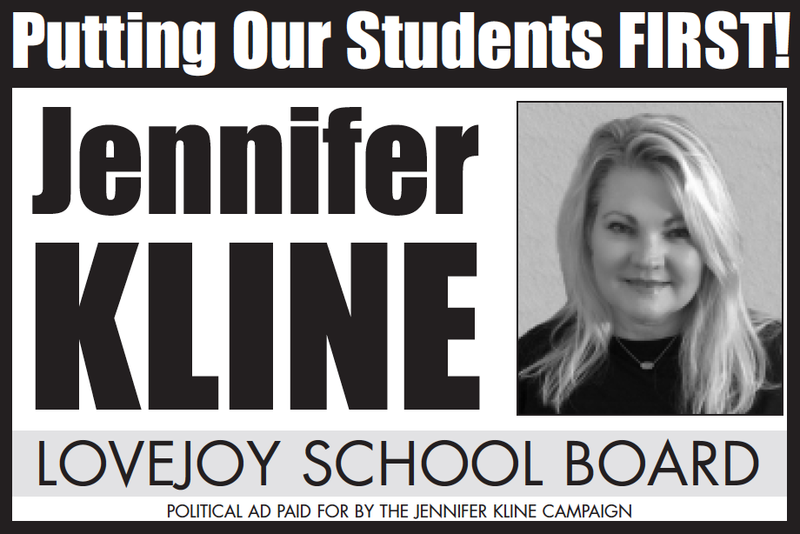 My name is Jennifer Kline and I’m running for Lovejoy School Board. I graduated from Arizona State University with a journalism degree and spent my professional years working in newspapers and public relations. I was the editor of my high school and college newspapers, then transitioned into public relations after college. I now work full-time raising my six children and supporting my husband, Paul, who travels extensively as a consultant. Paul and I have been happily married for 26 years and have built our lives around our family. Three of my children have already graduated from public schools and three are currently in Lovejoy schools. My son, Matthew, is a junior at Lovejoy High School. He is a mentor in PALS and plays football and basketball. Andrew is an 8th grader at Willow Springs who loves acting and singing and performs with the Limelight pop group at WSMS. He plans to play football next year. Finally, my fifth grader, Kamie, excels in soccer, volleyball and cheerleading and plans to sing in the choir next year. With six children, I have been involved in education for more than 20 years, devoting many hours to volunteer work in the classroom, in booster clubs, on PTO boards and as a Director for the Lake Travis Education Foundation. I am very proud of my work on the Foundation raising hundreds of thousands of dollars for schools, teachers and students. While serving on the Gala fundraising committee was an honor, I especially enjoyed working on the scholarship committee. Interviewing students and seeing their incredible academic and extracurricular achievements was a wonderful experience. I have also volunteered extensively in coaching and leadership positions in youth sports. We moved to Dallas for my husband’s job and chose Lucas as our home because of Lovejoy’s reputation as a superior school district and its small schools. The school size piece was huge for us. We have been happy with the district overall, but I see room for improvement. One of my biggest concerns is funding. While we must keep Lovejoy a superior school district, we should do that without taking more money out of the pockets of Lovejoy residents. I think we need to find solutions to budget issues with the funding we have and learn to live within our means. Another important issue is to keep our schools small and safe. Small schools provide more opportunities and a better educational experience for our students. Having lived in a district that grew too rapidly, I want to ensure we manage our growth responsibly and in a way that makes student safety a priority. Finally, I’d like to guide our district in living up to its superior reputation in every single area. Lovejoy students are some of the most talented I’ve ever seen, and we could be doing more to support all of our extra-curricular activities. This means making sure we have the best coaches, the best music, art and theater teachers, the latest technological advances and the most up to date training materials and methods. This also means giving every single club the attention and recognition they deserve. This article is a portion of the ad campaign paid for by the Jennifer Kline campaign.